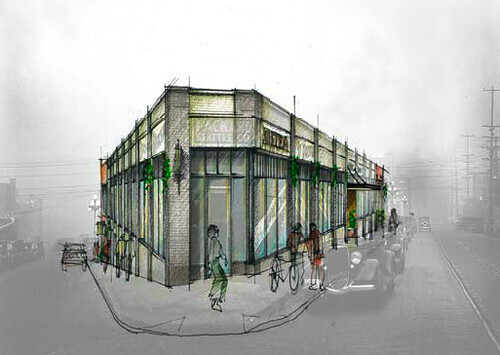 Two local developers plan to renovate two adjacent historic automotive buildings in the Pike-Pine neighborhood of Capitol Hill to be used for restaurant and retail. Liz Dunn of Dunn & Hobbes and Scott Shapiro of Eagle Rock Ventures announced on Monday that they had acquired the two buildings, at 1515 and 1531 Melrose Ave., and plan to renovate them once the current tenant, Metro Auto Rebuild, leaves at the end of January. She says tentative plans also include an oyster bar and a butcher shop. Sitka & Spruce’s Matt Dillon won’t leave Eastlake behind completely. He’s apparently planning a sandwich shop for the ‘hood. Thanks Whitney for the tips. You can learn more about the Melrose buildings in this PDF from the developers. Sugar, at Madison and Boren, is a fine local bakery just up First Hill from the new home of Sitka. I stop in when I have a few extra minutes before I catch a bus into work. Great pastries, cute little space, good people running it. Does Eastlake need another one? Really glad to hear SS is moving – much closer to my area! yay!